Ilhan Omar, a candidate for state representative for District 60B in Minnesota, gives an acceptance speech on election night, Nov. 8, 2016, in Minneapolis. 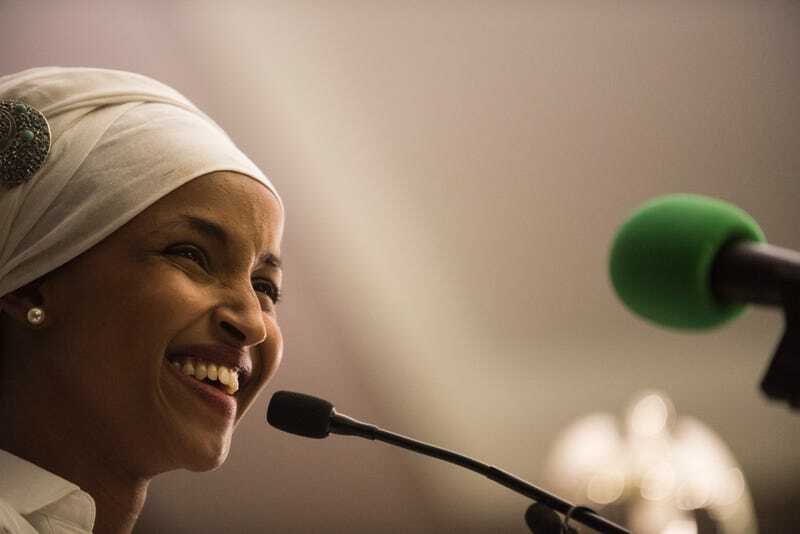 If you need something to brighten your spirits during this tough election cycle, Minnesota community activist Ilhan Omar became the first Somali-American Muslim female legislator Tuesday night. In truth, Omar, 34, became the clear front-runner for the position in August when she defeated a 44-year incumbent to become the Democratic nominee. She faced little Republican opposition and will represent "a diverse and liberal district in the State House of Representatives," the Huffington Post reports. "I am so proud of this win because District 60B represents Minnesota at its finest," Omar told the Star Tribune. "My neighbors and everyone here in this room represents what we as a nation want to be: united in our diversity. Longtime residents, East African immigrants and students—we came together and engaged in the political progress. We talked about the issues that concern us, and we connected on the future we want to create." Omar's story reads like a Dickensian tale. She was born in Somalia and spent four years in a Kenyan refugee camp before she immigrated to the U.S. The Star Tribune notes that her political career got off to a rocky start shortly after her primary win as conservative blogs decided to use Omar's personal life against her. Omar lives with Ahmed Hirsi, the father of her three children, but is legally married to another man, with whom she says she is in divorce proceedings. Conservative sites even went so far as to claim that Omar married her brother as a way to stay in the country, which Omar denies. On Tuesday, she was nothing but smiles. "Tonight we are celebrating this win, our win. But our work won’t stop. We will continue to build a more prosperous and equitable district—state and nation—where each and every one of us has opportunities to thrive and move forward together," she told the Star Tribune. Read more at the Huffington Post and the Star Tribune.